According to Moore County, N.C. Tax List in District No. 3 for the year 1845 to collect in 1846: Persons Names- Bean, Jesse; Location- McLendon's Creek; Land- 357 acres; Value- $510.00; White Polls- 1; Black Polls- 1; Tax- $4.22 10/100. According to Moore County, N.C. Tax List in District No. 3 for the collection of 1847: Persons Names- Bean, Jesse; Situation- McLendon's Creek; Land- 357 acres; Value- $510.00; White Polls- 1; Tax- $2.93 60/100. According to Moore County, N.C. Tax List in District No. 3 to be collected in 1849 for 1848: Persons Names- Bean, Jessee; Location- McLendon's Creek; Land- 357 acres; Value- $650.00; Black Polls- 1; Tax- $3.33 95/100. According to Moore County, N.C. Tax List in District No. 3 to be collected in 1849 to hand 22nd May 1849 A. R. Wadsworth: Persons Names- Bean, Jesse; Situation- McLendon's Creek; Land- 357 acres; Value- $510.00; White Polls- 1; Black Polls- 1; Tax- $4.59 10/100. According to the 1850 Census- Population Schedule, Jesse Bean and family resided at Bean's Bridge on McLendon's Creek in Moore County, N.C. The following information was recorded on August 8, 1850 on Page No. 168 [Stamped]; Page No. 335 [Handwritten]; Line No. 21- Dwelling No. 44; Family No. 44: Bean, Jesse, Age- 48, Male, Occupation listed as a Farmer, Value of Real Estate listed as $650.00, Birthplace listed as N.C.; Barsheba, Age- 28, Female, Birthplace listed as N.C.; A. William, Age- 15, Male, Birthplace listed as N.C., Attended School within the year; Mary, Age- 12, Female, Birthplace listed as N.C., Attended School within the year; Annette, Age- 3, Female, Birthplace listed as N.C.; Davis, Artin, Age- 19, Male, Occupation listed as a Farmer, Birthplace listed as N.C. According to Moore County, N.C. Tax List in District No. 3 for 1855: Name- Bean, Jesse, Location- McLennen's Creek, Number of acres- 564 1/2, Value of Land- $1,200.00, Black Polls- 3, Pleasure Carriages- $140.00; Name- Jesse Bean for Annetta Fry, Location- Crane's Creek, Number of acres- 623, Value of Land- $900.00, Black Polls- 4, Amount of Interest Received- $8.22. Fayetteville Observer, Semi-Weekly, Fayetteville, NC, December 29, 1859- "Bethlehem Academy: The second session of this Institution will commence on the 2nd Monday in January next (1860). It is situated about 5 miles west of Carthage, in a healthy and moral neighborhood. The course of instruction will be thorough, embracing such branches as are usually taught is schools of the highest grade. Pupils charged invariably from the time of entering to the close of the session, except by special contract. Tuition- $7.50, $12.00, and $16.00 per Session. Board- $7.00 per month. 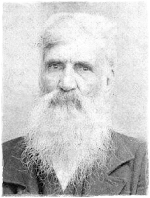 N. D. J. Clark, A. B., Principal, 78- 1t*3t, December 21, 1859." According to the 1860 Census- Population Schedule, Jesse Bean and family resided in Moore County, N.C. Post Office listed as Carthage, N.C. The following information was recorded on September 8, 1860 on Page No. 228 [Stamped]; Page No. 179 [Filled In]; Page No. 455 [Handwritten]; Line No. 18- Dwelling No. 1312; Family No. 1295: Jesse Bean, Esq., Age- 58, Male, Occupation listed as a Farmer, Value of Real Estate listed as $2,500.00, Value of Real Estate listed as $10,000.00, Birthplace listed as N.C.; Bashy, Age- 38, Female, Birthplace listed as N.C.; Mary, Age- 22, Female, Birthplace listed as N.C., School in year; Anrcett, Age- 13, Female, Birthplace listed as N.C., School in year; Annett F., Age- 12, Female, Birthplace listed as N.C., School in year; N.D.J. Clark, Age- 29, Male, Occupation listed as Teacher Academy, Birthplace listed as N.C. According to Moore County, N.C., Record of Accounts, Book 1; Pages No. 175-180: Jesse Bean, Estate- Inventory and List of Sale of the Property sold on Jun 1, 1869. Mentions- Mary Barrett, J. A. Barrett, L. W. Sullivan, Jesse Barrett, W. L. Sullivan, Lindsey Sullivan, Tom Barrett, John Sullivan, J. R. Brown and Alex.r Crook [consult- his section for his involvement in his maternal great uncle, Jesse Bean's estate]. According to the 1870 Census- Population Schedule, John A. Barrett and family resided in the Carthage Township, Moore County, N.C. Post Office listed as Carthage, N.C. The following information was recorded on Jun 21, 1870 on Page No. 6; Line No. 9- Dwelling No. 34; Family No. 34: Barrett, John A., Age- 33, Male, White, Occupation listed as a Farmer, Value of Real Estate listed as $600.00, Value of Personal Property listed as $1,500.00, Birthplace listed as N.C., Eligible to Vote; Mary E., Age- 32, Female, White, Birthplace listed as N.C.; Jesse S.B., Age- 8, Male, White, At Home, Birthplace listed as N.C., School in year; John M., Age- 6, Male, White, At Home, Birthplace listed as N.C., School in year; Mary A. E., Age- 4, Female, White, At Home, Birthplace listed as N.C.; Wm. C., Age- 1, Male, White, At Home, Birthplace listed as N.C.; May, Fanny, Age- 55, Female, Black, Pauper, Bithplace listed as N.C.; Infant, Age- 1, Male, Mulatto, At Home, Birthplace listed as N.C. According to the 1870 Census- Population Schedule, Dr. J. R. Brown and family resided in the Carthage Township, Moore County, N.C. Post Office listed as Carthage, N.C. The following information was recorded on Jun 20-21, 1870 on Page No. 2; Line No. 7- Dwelling No. 7; Family No. 7: Brown, Dr. J.R., Age- 33, Male, White, Occupation listed as a Physician, Value of Real Estate listed as $1,500.00, Value of Personal Property listed as $500.00, Birthplace listed as N.C., Eligible to Vote; Annetta J., Age- 22, Female, White, Birthplace listed as N.C.; John R., Age- 5, Male, White, Birthplace listed as N.C.; Willie C., Age- 3, Male, White, Birthplace listed as N.C.; Hurley, Malcom, Age- 19, Male, White, At School, Birthplace listed as N.C.; Barrett, Noah, Age- 19, Male, Mulatto, Occupation listed as a Laborer, Birthplace listed as N.C.; Bean, Francis, Age- 14, Female, Black, Occupation listed as a Domestic Servant, Birthplace listed as N.C., Listed as Cannot Read or Write. Unable to find Charles N. Wright and Sarah J. Bean in the 1870 Census! !